… In which I resolve my husband’s diet dilemma during football playoffs by applying dark days’ local logic. There might have been a time, call it last week, when my husband would sit in front of the TV watching football or politics, mindlessly eating a bag of tortilla chips or other such thing. If lucky, he’d break out one of the jars of the five kinds of salsa that I canned last summer – tomato with peppers, ancho chili, chili peach, tomatillo, and tomatillo with husk cherries. The delicious and nutritious salsa was not the problem. It was the ridiculous amount of carbs, salt, and fats in the chips. So now, doctor’s orders are to eat beans, lots of beans, and to restrict protein to poultry and fish. I told him that he’s either full of beans, or just a turkey. No I didn’t, but I’ll save the line. We so greatly associate the Super Bowl with chili that our local Whole Foods sponsors an annual chili cook-off among its departments, coming up this weekend, in time of course to buy the ingredients and whip up a batch for the big day. I’m always pleased when Seafood wins, but have to say that the variety is pretty amazing. The HR department knows how to please a crowd. My husband would like the one made with beef, sausage and beer, bound together with the ingredients of a tomato-based salsa. Not this year. I need to supply the beans alright but instead of “hiding them in plain sight” as in the past few dishes, I’ll just slip them into a chili. Locally, this one-pot meal is not much of a challenge no matter what your choice of protein. I chose ground turkey from nearby Griggstown Quail Farm and dried red beans from Cayuga Pure Organics, a little outside my normal geographic reach, but in-bounds for my personal DD Challenge. Both are very flavorful when cooked. I happen to crave tomatoes at all times of year so I used an abundant amount of the tomato puree that I canned last summer with the Amish Paste, Plum Dandy and field tomatoes from our CSA. I used a local red onion from last week’s farmers’ market, fresh poblano peppers from my own plant (the huge one we dubbed the “big ancho-lada,” harvested early and keeping remarkably well in the fridge), local organic garlic, an assortment of dried hot peppers from our CSA and my garden, and a handful of an oregano-like herb which is over-wintering nicely in my outdoor pots. The only non-local ingredients were salt, whole cumin seed and a few cloves. As a lark, I actually made this – including the beans — in one pot, using one additional bowl and my cutting board. I’ve rationalized the recipe since my insistence on one pot yielded a long cooking process. This is not Texas Chili. 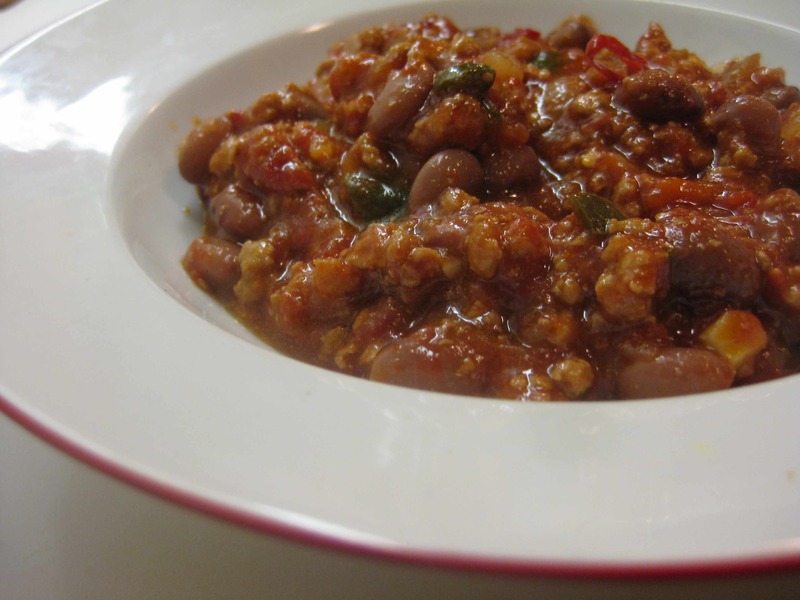 It is a mild and highly flavorful, somewhat spicy NJ chili. If you add the beans at the end as I did, you will have to refresh the salt and spices since the beans absorb a lot. Heat a large saucepan over medium-high heat. Break up the ground turkey into clumps and add to the pan, stirring to sear and lightly brown the meat. Remove to a colander to drain, reserving the fat. 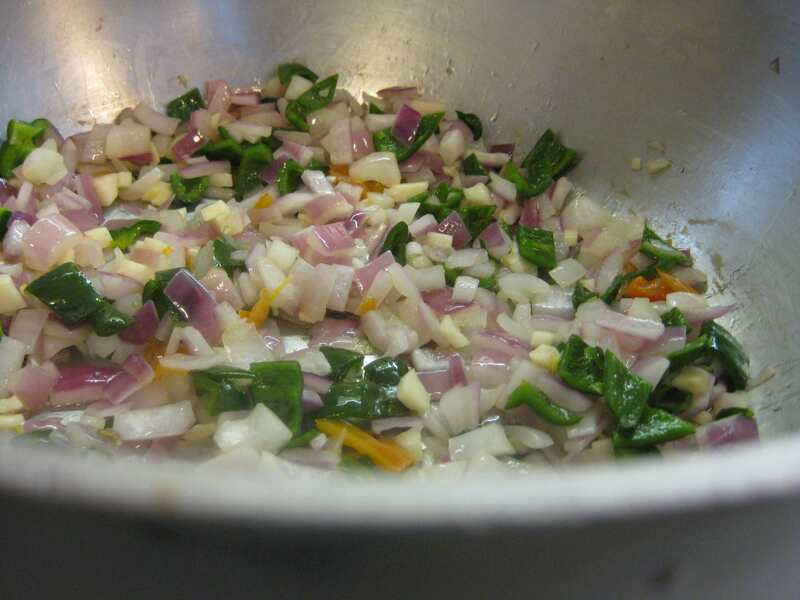 Saute the onion, pepper, and garlic in the turkey fat until the onion is translucent. Add the turkey meat to the pan along with the tomatoes, and stir to combine. Add the ground cumin, cloves, chili peppers and oregano and bring to a near-boil. Lower the heat and cook over very low, stirring occasionally, for about 2 hours. (Pre-soaked dried beans take a similar amount of time so you can cook them simultaneously.) Add the beans and season to taste. 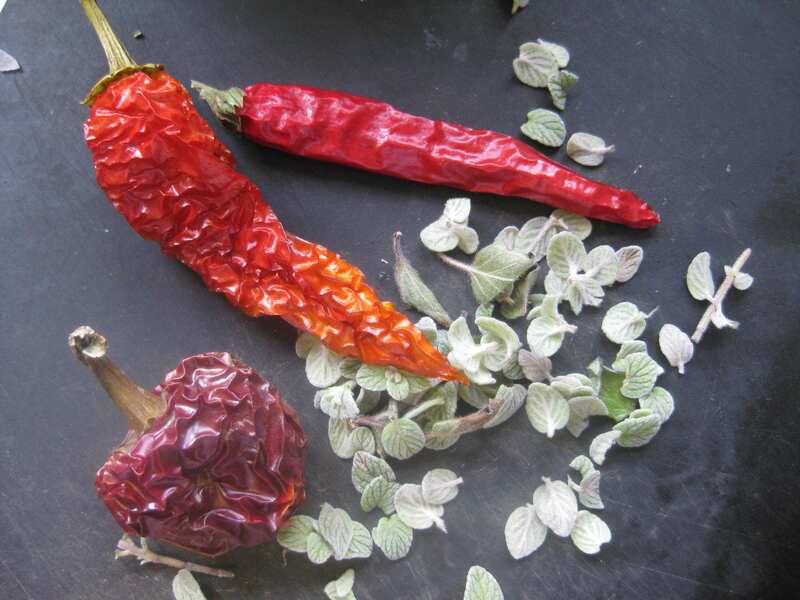 You can discard the dried chilis or de-seed them and chop the flesh to add to the chili. Remove the cloves if you can find them. Let the chili sit for a few hours or a day before serving to meld the flavors. Just before serving, crumble on additional dried chili, and add a few toasted whole cumin seeds, fresh oregano, and some chopped fresh onion.